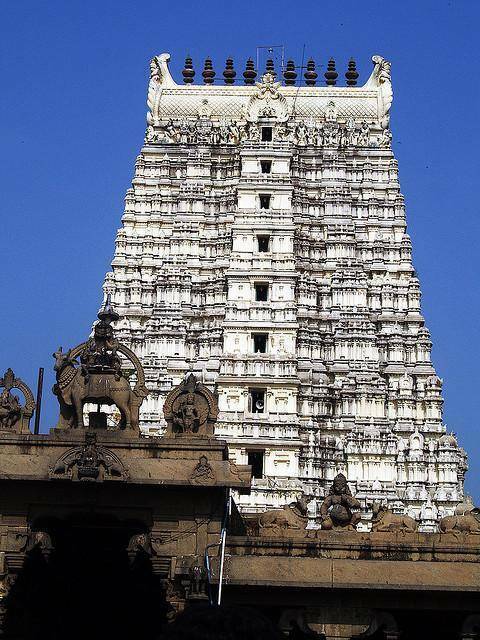 The major attraction of Rameswaram is the Ramanathaswamy Temple. It is located in the center of the city. The temple is dedicated to Lord Shiva. In sanctum sanctorum, Lord Shiva presides as a Shiv Ling. Hence the temple is one of the 12 Jyotirlinga (Pillar of Light) Shrine. The most sacred Nayanar Sages namely Appar, Sundarar and Tirugnana Sambandar, had written Hymns on this temple. According to Ramayana, Lord Rama after returning back from Sri Lanka along with his consort Sita, took the advice of sages, installed a Shiv Ling and worshipped to be relieved from “Brahmahatya Dosham” (Curse) for killing Raavan, a Brahmin in the Battle. Later in 12th century Pandya King built a temple for the Shiv Ling. Sethupathis contributed a lot for the current architecture of the Temple. The temple has a 1000 pillared hall in which the Pillars are carved in Nayakar Style. The width of these columned corridors varies from 17 to 21 feet and height 25 feet. Through centuries the temple was renovated by Kings of various dynasties. The Chockattan Mandapam and the domes were restored from ruins by Pradani Muthirulappa Pillai. Parakrama Bahu, the 11th century ruler of Sri Lanka renovated the sanctum sanctorum of the temple. Tourists can see a separate shrine for Nataraja (Lord Shiva in Dancing form) in the eastern corridor and the shrine was built by Dalavai Sethupathy in 16th century. Tourists can also come across a statue of Muthu Ramalinga Sethupathi, in the entrance of third enclosure. Muthu Ramalinga Sethupathi constructed the third corridor during 17th century. Also as per Skanda Purana there are nearly 24 sacred tanks (Theertham) or well in and around Rameswaram. Among which 14 tanks are located within the precinct of temple. It is an important ritual to take a dip in all these Theertham to wash away our sins. Also people from all over India come to Rameswaram to offer Pindam (a final offering) to their ancestors so that their soul will always rest in peace.